Hello dear cooking blog. I have to tell you about an experiment I made tonight that turned out pretty darn good. Oh, certainly there are ways to make this even better and some of them would up the calories and fat, but this was quite satisfying. You may know that I am trying to cook light and healthy and take off some of this winter blubber. It is possible to cook healthy but still have tons of flavor. I stopped by my local Asian grocery on the way home from work and happened to find some of those small little round purple eggplants. So I grabbed some. All the way home I was trying to figure out how to make a curry without the fat. I came up with this. For my curry paste, I made a purée of one onion, 6 cloves of garlic, 2 tbsp of ginger and a couple of thai chilis. 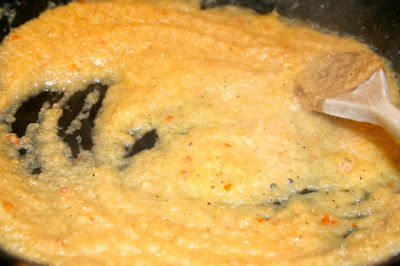 This was simply thrown into a hot pan along with a tbsp of oil, a tbsp of curry powder, salt and pepper. 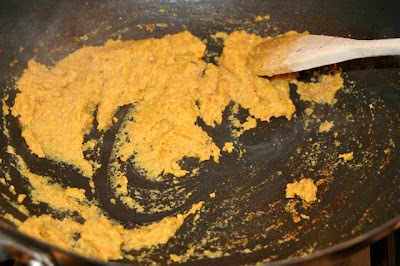 I cooked the paste down for about 5-6 minutes with constant stirring until most of the water from the onion had been cooked out and it began to brown a bit. This gives great color and flavor. You want to cook out the raw onion bitterness. This paste will help thicken my sauce. If I had thought ahead, I would have also thrown in a couple of the raw shrimp into the purée. This would have added another level of flavor to the overall dish. This is a great trick to do in dishes where you want the flavor of ingredients that you really don’t want to stew for a long time. 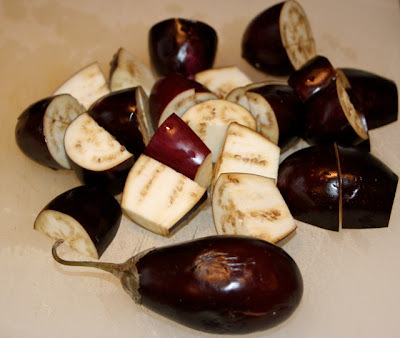 Once the paste was cooked out I added a cup of water and 6 small eggplants cut into quarters. 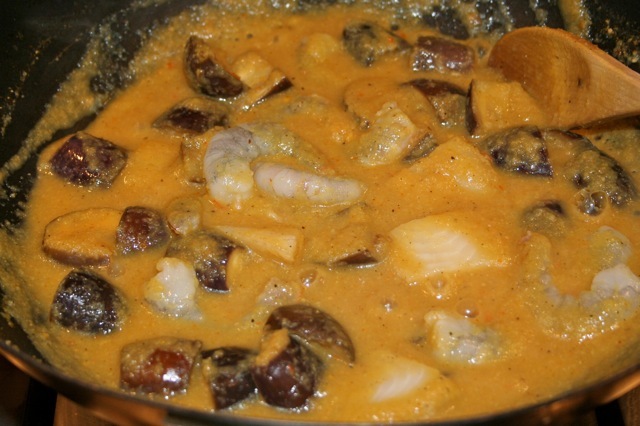 The eggplant and sauce mixture was cooked covered for about 15 minutes until the eggplant became very tender and the sauce thickened a bit. 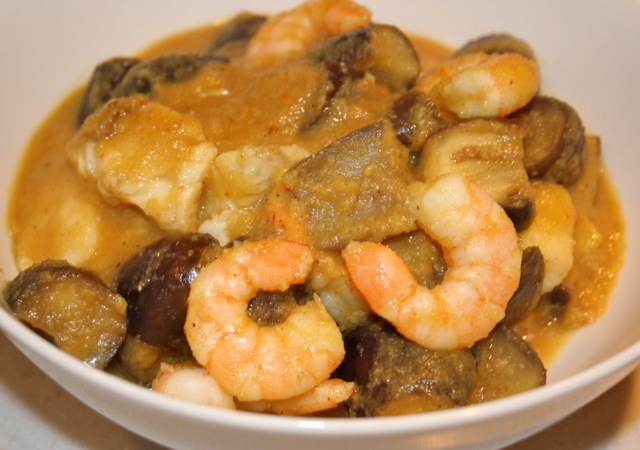 About 3 oz of tilapia and 4 oz of peeled raw shrimp were added to the pan. This was covered and cooked for just a few minutes until the seafood was cooked through. I think the dish turned out great. 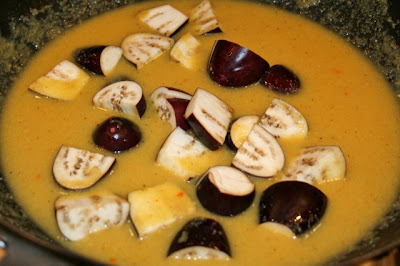 You could make this even better if instead of water added to the cooked paste you added a can of coconut milk! I thought about it but I didn’t want the added fat tonight. That would take this dish over the top! If I do this again I would also add some fresh curry leaves when I throw in the eggplant and finish it off with some fresh cilantro leaves and a squeeze of lime. Oh, some Thai basil would be a great last minute addition too.